When I was just a lass, one of my favourite stories and one that I return to even now on occasion was Treasure Island. As you no doubt already know, the action starts in the unassuming surroundings of a tavern that goes by the name of the Admiral Benbow. As a girl I naturally had no idea where this inn had found its name but as I grew older and my interest in all things Georgian increased, then I learnt the tale of the real Admiral Benbow and since today marks the anniversary of his death, it seemed like a good time to share that story with you. Benbow served with the Royal Navy from the age of twenty five. Despite the occasional brush with authority and a some time spent in private service, he eventually returned to the forces and rose through the ranks during a series of voyages and missions. 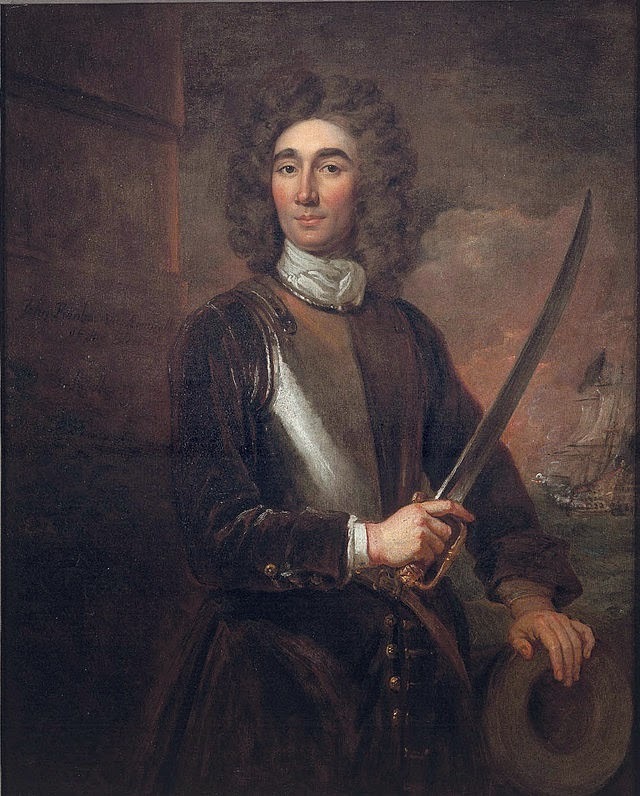 By the time Benbow found himself commanding the fleet in the West Indies in 1701, he had attained the title of Admiral and was held in high esteem by his superiors and at court. On the fateful day of 19th August 1702, Benbow's ships encountered French forces off the coast of Santa Marta and gave chase. Although Benbow led his group of seven across five long days of pursuit, four of his fellow captains appeared less keen and seemed to deliberately hang back, showing no inclination to engage the French. When the battle finally commenced, a barrage of chain shot struck the deck of HMS Breda where Benbow stood, shattering his right leg. Still the Admiral remained above decks, determined to remain in command until his injuries finally compelled him to make for the safety of Jamaica. Upon reaching land the furious Benbow set in motion the court martial of his fellow captains for their insubordination. Although they would be convicted and two executed, the Admiral did not life to see their fate. Instead, his condition began to deteriorate and despite efforts to treat the terrible injuries to his leg, things appeared to be going downhill fast for the Admiral. He lingered on for months and into autumn but, on 4th November 1702, Admiral Benbow succumbed to his wounds. He died in Port Royal and was laid to rest in Kingston, though he lives on in the tales of the Royal Navy and Treasure Island alike! I was really excited when I first discovered it! Can't beat a good shanty! We learned the shanty in primary school. Basically it tells the story of "brave Benbow" in a multitude of verses.